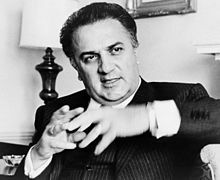 Federico Fellini (20 January 1920 – 31 October 1993) was a highly esteemed and influential Italian film director. 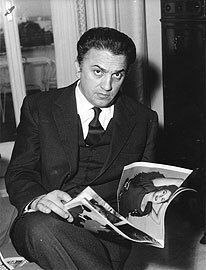 Fellini's films typically combine memory, dreams, and fantasy. Among the most famous of his films are La Strada, La Dolce Vita, 8½, and Amarcord. The cinema uses the language of dreams; years can pass in a second and you can hop from one place to another. It’s a language made of image. Cinema is an old whore, like circus and variety, who knows how to give many kinds of pleasure. Besides, you can’t teach old fleas new dogs. What is an artist? A provincial who finds himself somewhere between a physical reality and a metaphysical one... It’s this in-between that I’m calling a province, this frontier country between the tangible world and the intangible one — which is really the realm of the artist. Fellini on Fellini (1976) edited by Anna Keel and Christian Strich; translated by Isabel Quigly. I don't believe in total freedom for the artist. Left on his own, free to do anything he likes, the artist ends up doing nothing at all. Everyone knows that time is Death, that Death hides in clocks. Imposing another time powered by the Clock of the Imagination, however, can refuse his law. Here, freed of the Grim Reaper's scythe, we learn that pain is knowledge and all knowledge pain. The public has lost the habit of movie-going because the cinema no longer possesses the charm, the hypnotic charisma, the authority it once commanded. The image it once held for us all — that of a dream we dreamt with our eyes open — has disappeared. Is it still possible that one thousand people might group together in the dark and experience the dream that a single individual has directed? No critic writing about a film could say more than the film itself, although they do their best to make us think the opposite. If I'm a cruel satirist at least I'm not a hyprocrite: I never judge what other people do. Neither a politician nor a priest, I never censor what others do. 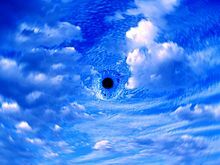 Neither a philospher nor a psychiatrist, I never bother trying to analyze or resolve my fears and neuroses. "Recipe for a Good Film"
The young watch television twenty-four hours a day, they don't read and they rarely listen. This incessant bombardment of images has developed a hypertrophied eye condition that's turning them into a race of mutants. They should pass a law for a total reeducation of the young, making children visit the Galleria Borghese on a daily basis.